Career Instructors Jenée Wilde and Stephen Rust recently facilitated a workshop on Comics Justice at the Equity and Social Justice TeachIN, an annual event sponsored by the College of Education. This year's TeachIN occured on Saturday, November 17th. TeachIN brings college educators together with high school, middle school, and elementary teachers from across the state to discuss a wide range of social justice concerns. Sharing their experiences teaching UO's Common Reading, Thi Bui's The Best We Could Do, and Alan Moore's classic V for Vendetta, Dr. Wilde, Dr. Rust, and some of their students developed a discussion about using graphic novels to address concerns about equity, inclusion, and barriers to students success at all levels of education. This presentation continues the incredible work Drs. Wilde and Rust have done to promote equity, inclusion, and ethical argumentation. They have colaborated to produce a new edition of The Culture of Science, a writing course casebook that encourages students to interrogate the possibilities, limits, and exclusionary effects of scientific discourse. They have also been active participants in Composition's antiracism initiatives, especially by piloting contract grading for writing courses, helping to develop more effective writing course outcomes, and working with the Inclusive Pedagogies Research Interest Group. 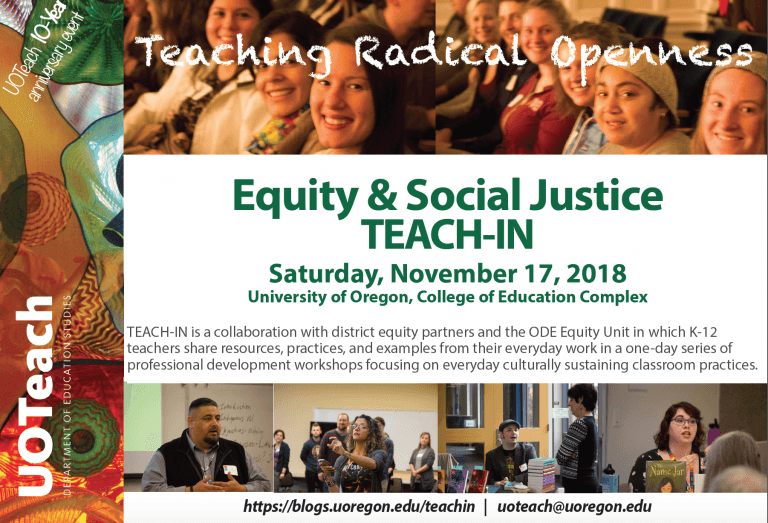 TeachIN is a partnership between state and district equity groups, the UO Common Read, and the Oregon Safe Schools and Communities Coalition. Teachers share resources, practices, and examples from their everyday work to bring together the best of culturally sustaining instructional theories and everyday classroom teacher practice. For more information about this tremendous event, as well as a program, please see the TeachIN homepage.